It’s been repeated time and time again, year after year: “I can’t make up my mind. I don’t know what film I want to see next.” It’s no different year this year. There are so many great films and events and so little time that sophisticated scheduling and strategic planning skills are essential for navigating the Telluride Film Festival. But I have to admit that for the first day and a half of XLIV the three most rewarding cinematic experiences came about not as the result of proper process but from recollections of film festivals, directors and actors, from years past. Alexander Payne is a great storyteller, and he has a remarkable comedic, if not slightly and darkly satirical way about his films. With Nebraska (2013) and Sideways (2004) in my relatively exclusive list of “favorite films” I was anxious to see what Downsizing was all about. “Going small,” ostensibly for reasons both fiscal and ecological—if the world’s population could be reduced in size, literally and figuratively, wouldn’t it make sense that its consumption of all things material would be reduced as well? And wouldn’t that in the larger picture help save the planet? Interesting idea. And Downsizing is very clever—from many angles—in explaining how that might play out. Payne’s films are not just satirical comedy. There’s always more; a cautionary message or two, or “the other side of the coin” reminder to consider. Downsizing is an intelligent, thought provoking, and a make you laugh out loud experience. With Matt Damon as a self-questioning occupational therapist in the lead role, and Christoph Waltz, Kristen Wiig, Laura Dern, Jason Sudeikis, and Neil Patrick Harris in supporting roles the film and its audience are in good hands. Hong Chau, perhaps, steals the show. A Vietnamese refugee who has been “reduced” as punishment for her dissidence her quirky, in-your-face philanthropy changes Paul Safranek’s (Damon) life. Downsizing leaves the viewer aware that no matter how much things may change they remain disturbingly the same. Greta Gerwig starred in and co-wrote Francis Ha, a film that was screened in Telluride in 2012. She and the film caught my attention. It seemed only a matter of time before we’d hear from Greta again. With Lady Bird we’ve heard from her in a very big and wonderful way. Lady Bird is a mother-daughter story, of conflict and misunderstanding, of redemption and love. It’s about Sacramento, too, a place that is generally viewed as a good place to be from. There’s a rhythm to Lady Bird that brings the viewer along with the title character (Saoirse Ronan, Brooklyn, The Lovely Bones) as she negotiates the last year of high school, and its attendant rites of passage. The film’s final scenes are touchingly tender yet strong, the consequence of excellent storytelling and a strong cast, including Laurie Metcalf as the overbearing, at times bitter and “bad cop” mom and Tracy Letts as the patient, sensitive “good cop” dad. And it is, of course, a tribute to Greta Gerwig, to her writing and to her directing. It’s safe to say we will hear from her again. The sooner the better. Gloria was one of my favorite films from the 2013 Telluride Film Festival. When I learned that Director Sebastian Lelio was bringing A Fantastic Woman to this year’s festival I immediately put it on my must-see list. And on the way up to the Chuck Jones on Saturday morning I had the great good fortune to share the gondola with the director and star, Daniela Vega. This is Lelio’s second visit to Telluride and he has only fine things to say about the festival. 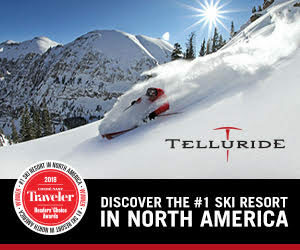 Sebastian reaffirms the widely held view that Telluride is unique in the film festival universe. Not just for its scenic beauty and friendly audiences, which are legendary. It’s the ability for film people to mix with the attendees and film fans on the street, in a restaurant, or in just the sort of way we shared conversations about movies and actors in that gondola car that makes Telluride so very special. Annette Benning is magnificent in Film Stars Don’t Die in Liverpool and Loving Vincent should be viewed for its artful mastery. But, of course, we’re not even half way through the festival. More to come with the likes of The Darkest Hour, Hostiles, The Shape of Water, Cotton Club Encore, Battle of The Sexes, and more, so many more films. I just can’t choose which ones I’ll see. 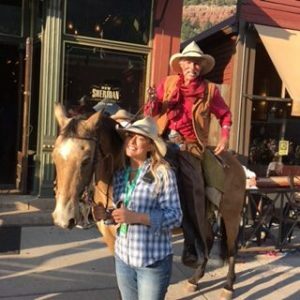 The “Friday Night Feed on Main Street” was made more memorable this year with the appearance of Roudy on horseback, on Main Street, and in a scene also reminiscent of years gone by with a brief visit into the Sheridan Bar. —Ed. note: Paul O’Rourke dishes on the first round of films he watched at Telluride Film Festival. Stay tuned for his second dispatch.